Anytime is a great time to visit Halong Bay but some months receive more visitors than the others. The peak season falls on December and January - the months that coincide with Christmas and New Year break. Other months that also see busy lines of travellers include October, November, February, March and April. During these months, the weather is also most suitable to visit Halong Bay. The period from May to September is often considered a low season for international travellers in Halong Bay. Besides the glowing sun - which makes it perfect for water based activities, the uncrowded beach and various cruise promotions are all attractive reasons for you to plan your holiday around this time of the year. Similar to the climate of other northern regions in Vietnam, Halong weather in January can be freezing (however, January of 2015 and 2016 have actually been quite warm). The temperature ranges from 130 – 260C with average humidity between 60 and 70%. There are sunny days in this month, despite the occasional strong wind, which make your photo session of the most beautiful bay on earth a breeze. Some actually find pleasure in traveling to Halong Bay in January as it is not as hot and humid as summer time. January is a high tourist season in Halong Bay. Although the weather is chilly, this is a wonderful time for travelers who want to avoid the sweaty summer of Vietnam. Admiring the spectacular beauty of beautiful beaches, diverse-shaped caves, and peaceful floating villages in tranquility is the best way to enjoy a restful holiday and relive stress in daily life. Please note that some activities such as swimming or diving may not be organized if weather turns too cold. Halong Bay Weather in February is more comforting than in January. The climate in this month is warmer with the temperature ranging from 150 to 300C. The humidity fluctuates from 65 to 70%. Normally, Early February is colder, meanwhile, from Middle to Late February, days will have more sunshine with higher temperature (230 – 280C) in comparison to the rest of the month. The average rainfall is from 200 – 300mm. February is generally the time that Vietnamese people prepare for and welcome Tet Holiday. Hence, visiting Halong Bay at this time, you can both admire the beauty of Halong’s natural heritage but also feel the festive mood on every street you go. Some cruises organize Lunar New Year party on boat to get you a glimpse into Vietnamese’s most important event of the year. However, as it is a time for family reunion, some cruises may suspend services during the holiday. Halong Bay is best seen in March, many tourists claim, attributing it to the warm fresh air. The temperature fluctuates from 180 – 340C for the first half of the month while from mid March onwards, the weather will be warmer and has more sunny days. The lowest and the highest temperature at this period are 210C and 340C respectively. The climate gradually becomes cooler and more pleasant in the last days of the month. Nonetheless, the northeast monsoons may occasionally appear. The average humidity in March is around 75%. The average rainfall is 255mm. March is the month of festivals. After Tet Holiday, there are many cultural and spiritual festivals held. If you are traveling to Halong Bay at this time, you should consider taking a side trip to Yen Tu Religious complex or Yen Duc village. (Yen Tu Festival is often held from 10th January to the last day of March of the lunar calendar, or from March to mid May in Gregorian calendar). In April, Halong Bay weather is warmer and nicer. There may have occasionally strong winds, however, the climate is not as harsh as in January, therefore, tourists can enjoy the most beautiful days in spring. It can be said that April is one of the most ideal time to cruise in Halong Bay. At that time, the weather is not as extremely hot as in summer and as bitterly cold as in winter. This is a reason why April starts a tourist season in a year. The temperature in this month ranges from 18 – 360C. The humidity is about 75%. The average rainfall increases by 20mm compared to March. Similar to March, April is a perfect month to visit Halong Bay. The warm weather coupling with clear air makes Halong Bay more vivid than any other month of the year. 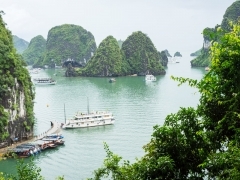 However, it is advisable that you avoid the last few days in April as it coincides with Vietnam’s national holiday and there will be a flood of local tourists onsite and price may surge slightly. Although this is the last month of spring, May seem more like summer in Vietnam. The latter half of the month often sees a significant increase of temperature and precipitation. The weather sometimes cannot be predicted because the tropical depressions can go through and cause some cold days. Hence, it should be the best way if you check the weather forecast before a couple of days. The temperature is approximately from 29 – 400C. The humidity fluctuates from 75 – 800C but rains are not yet frequent. May is considered the secret ideal month to visit Halong Bay by many travelers. As it is not mentioned frequently on guide book as a desired time, there are not many tourists visiting the Bay in this month and many cruises put on promotion program. In fact, there is very little rain, the sun has yet to become overheated, and it is just perfect to swim or kayak on the Bay. If you are lucky, you can get a cruise trip for just 2/3 of what you normally pay in peak season. June is a starting time for busy domestic tourist season in Halong Bay. This is a typical month for summer in Vietnam with the temperature fluctuating from 31 – 390C. The weather at Bay is actually more pleasant with wind blow from the sea and you will not feel the whole scorching heat. The precipitation in June is high with over 1,000mm. Heavy rains occur more frequent. June is the starting time of peak tourist season for domestic travelers. This is the time that students begin their summer holiday. Many families come to Quang Ninh to avoid the sweltering heat of summer, especially in weekend. Therefore, you should travel Halong Bay at weekday to avoid the crowd. Similar to June, July is still a typical sweltering month in summer. The sultry heat still dominates during the month. At night, the temperature is higher in comparison to the previous month which causes the sweltering feeling. However, the temperature at night decreases by 30 – 40 in comparison to the day time. The rainfall continues increasing up to 1,200mm. The average temperature in the day time and the night time is respectively 380C and 280C. The highest temperature in this month reaches 380 – 400C. The humidity is also high with the average of 77%. This is a rainy and stormy month, therefore, travelers should carefully check the weather forecast to enjoy a smooth and convenient cruise. In June and July, Halong Bay often undergoes occasional storms. Cruises may get cancelled in case the Halong Management Board do not issue permit for cruise to sail on that day. The average number of storm days in July in the past 5 years is 3 days. Read more about our policy regarding storm days. In August, the climate is more gentle with the lower temperature compared to June and July. The sweltering heat is replaced by the cool weather signaling an upcoming fall. Light winds blow more frequently creating cool and pleasant feeling. The temperature drops by 30 – 40C in comparison to June and July. The highest temperature in the month reaches around 360C. The average humidity is approximately 75%. It is estimated that there are 18 – 20 rainy days in August with the rainfall of around 1,000mm. However, tourists do not need to worry about this because these light rains do not have the great influence on cruising in Halong Bay. In contrast, they make the weather become gentler and milder. When the rainy season ends, September is the beginning of beautiful days in autumn. Being known as the transferring time between summer and fall, September is cooler and milder in comparison to the previous months. The temperature remains high and fluctuates from 280 – 360C. Nonetheless, the heat in this month is no longer as severe as in June and July. The decrease of humidity in combination with sea breezes and pleasant sunshine will make your cruise trip in Halong more enjoyable. Rains still appear but not too much. Similar to August, September has nice weather to enjoy a wonderful cruise in Halong Bay. Make sure that you visit well-known attractions of the Bay such as Tuan Chau Island, Ba Trai Dao beach, Vung Vieng Floating Fishing Village, Luon Cave, etc. for water based activities. Squid fishing at night is also worth trying, if weather permits. Compared to September, the weather in October is even cooler and more pleasant. Cool and fresh breezes blow more frequently. In Vietnam in general and in Halong Bay in particular, October is considered as one of the most stunning times in the year. The autumn weather with cool breezes and pleasant sunshine is a wonderful condition to take a cruising trip in Halong Bay. The average temperature decreases to 240C at night and 280C during daytime. Average humidity is around 72% and the rainfall levels at 600mm. In the last days of the month, the weather may be chilly and the northeastern monsoon may occur. However, this is still plenty of good time to enjoy nice weather before the cold winter arrives. November often witnesses a marked change in weather pattern. In early November, tourists can still enjoy the cool autumn breeze with bright sun. The rest of the month, however, may see a switch to colder wind blow. The monsoons may occur with the increasing frequency and humidity drops significantly. November is the transferring time between autumn and winter, therefore, you are advised to bring some light winter clothes such as cardigan or silk scarf just in case you are caught in the wind. For mild weather days, you can still enjoy all water based activities such as swimming, kayaking or scuba diving. December is the coldest and driest month in a year. The temperature drops with the range from 170 – 260C and at night it may become even lower. In December, the nighttime is often longer than the daytime win sunshine hours between 7:00am and 5:00pm. The average humidity is around 70%. Rain occurs sporadically in form of drizzle. It is best that you prepare warm clothes just in case. Similar to January, December is a peak tourist season in Halong Bay. This is largely due to Christmas and New Year holiday that most of you will have. Although the weather is cold, this is a really wonderful time for travelers to visit Halong Bay. On 24th and 31th December, most cruises organize themed parties and GALA dinners on board to give you a brilliantly unique experience at Halong Bay.